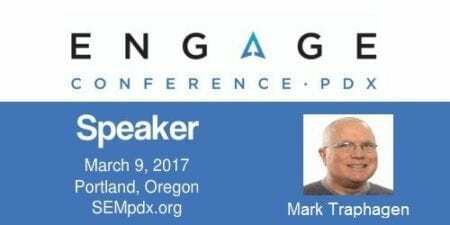 Mark Traphagen will be speaking on Links at the Engage Conference, which will take place March 9, 2017 in Portland. For more information, or to purchase tickets, please click here. 1) Please give us your background and let us know what you do for a living. For most of my adult life I was a teacher (middle and high school English), although I spent some time in sales in my 20s. About ten years ago I took on the mission of helping a failing independent bookstore get online and succeed by marketing to a niche community and winning their loyalty over that Big Store that starts with an “A.” In the process, I was bitten deeply by the digital marketing bug, and knew this is what I wanted to when I grew up (if that ever happens). I went on to get a job with a small digital marketing agency in Raleigh NC, and proceeded to learn everything I could about the business from some very smart people there. I also began writing actively for their blog, which led to opportunities to guest post elsewhere, which led to invitations to speak at great conferences like Engage, and the amassing of a 150,000+ social media following, all organically gained. That exposure led to an offer from Eric Enge, one of my top SEO heroes, to join his team at Stone Temple. For my first three years there I helped build the marketing team, and then assumed the position as Director of Brand Evangelism, responsible for connecting enterprise-level companies with the solutions our agency can provide. 2) How can somebody build an effective link profile without relying on an expensive toolset? You can use Moz Open Site Explorer for one inexpensive-ish option to find the Domain Authority of leading sites in your market space, and focus your content marketing efforts on them. If that’s still too expensive, you can use your knowledge of your market to figure out who the most authoritative sites covering it are. What are the sites you go to for information? Where do the top experts you know write? Even if you only know only one or two of the top sites, which are the other sites that those sites reference? Or, the top experts you know, what are the sites they reference? In the long run, these are the sites you want referencing you. Start figuring out how to make that happen. Fair warning – you may need to take this in stages. Those sites may not be willing to write about you today, or may not be willing to allow you to guest post there today. So now what? Perhaps, you need to work your way there in stages, starting with the next tier down of sites. Not to worry, you can get there, provided you work your way there in stages. 3) Many in our industry think Google is seeking to devalue the power of links. What are your thoughts? At Stone Temple Consulting we were seeing absolutely no diminishing of the power of links to increase ranking. We still are able to move significant keywords for our clients through links from high quality content placements on reputable, relevant sites. This made us skeptical of all the “links aren’t as important anymore” talk, so we decided to test it. After reviewing the correlations between links and ranking in the more popular studies out there, our CEO Eric Enge used a broader set of queries and what we think is a more accurate statistical methodology to re-examine just how strong is the correlation between the number of links to a page and its ability to rank in Google Search. And the answer is…come to Engage Portland to find out! In our session on links I’ll present the full results of our study and how it should impact your SEO strategy going forward.